For other plants called myrtle, see Myrtle. Lagerstroemia /ˌleɪɡərˈstriːmiə/,  commonly known as crape myrtle or crepe myrtle, is a genus of around 50 species of deciduous and evergreen trees and shrubs native to the Indian subcontinent, southeast Asia, northern Australia, and parts of Oceania, cultivated in warmer climates around the world. It is a member of the family Lythraceae, which are also known as the loosestrife family. The genus is named after the Swedish merchant Magnus von Lagerström, a director of the Swedish East India Company who supplied Carl Linnaeus with plants he collected. These flowering trees are beautifully colored and are often planted both privately and commercially as ornamentals. 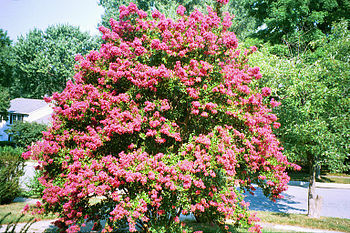 Crepe myrtles are chiefly known for their colorful and long-lasting flowers which occur in summer. Most species of Lagerstroemia have sinewy, fluted stems and branches with a mottled appearance that arises from having bark that sheds throughout the year. 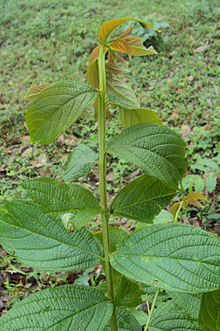 The leaves are opposite and simple, with entire margins, and vary from 5–20 cm (2–8 in). While all species are woody in nature, they can range in height from over 30 m (100 ft) to under 30 cm (1 ft); most, however, are small to medium multiple-trunked trees and shrubs. The leaves of temperate species provide autumn color. Flowers are borne in summer and autumn in panicles of crinkled flowers with a crepe-like texture. Colors vary from deep purple to red to white, with almost every shade in between. Although no blue-flowered varieties exist, the flowers trend toward the blue end of the spectrum with no orange or yellow except in stamens and pistils. The fruit is a capsule, green and succulent at first, then ripening to dark brown or black dryness. It splits along six or seven lines, producing teeth much like those of the calyx, and releases numerous, small, winged seeds. In their respective climates, both subtropical and tropical species are common in domestic and commercial landscapes. The timber of some species has been used to manufacture bridges, furniture, and railway sleepers,  but in Vietnam's Cat Tien National Park, the dominant stands of Lagerstroemia calyculata in secondary forest are thought to have survived (after episodes of logging) due to the low quality of wood. 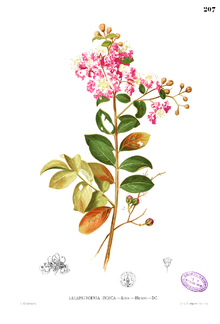 Lagerstroemia species are used as food plants by the larvae of some Lepidoptera (moth and butterfly) species including Endoclita malabaricus. Certain species of crepe myrtle are used in landscaping and gardening as screens, lawn specimens, shrub borders, and container plants. [ citation needed] Since crepe myrtles are found in many places, there are differing opinions as to how to cultivate them in landscaping. Each year, the crepe myrtles must be cut back to allow for new growth over the next season, and the disagreement lies in how much should the trees be cut back. Some prefer only a tiny bit, while some prefer to cut them down almost all the way to the main trunks. In doing this, more growth is allowed, but one can cut back too far. Cutting crepe myrtles back too far can be detrimental because it prevents the trees from forming beautiful, mottled bark on mature trunks. It also creates a forest of skinny, whip-like shoots sprouts from the end of each ugly stump that remained from the last season. These whips are too weak to hold up the flowers, so the branches often bend to the ground. Many Southerners have crepe myrtles in their yards, but this cutting back too far generally takes place here. Drive through any Southern neighborhood in early spring and, before long, you’ll encounter a spiritually fulfilled suburbanite, pruning saw in hand and a pile of crepe myrtle branches on the ground. Many well-meaning gardeners “murder” their crepe myrtles because they see others doing it. The common crepe myrtle (L. indica) from China and Korea was introduced circa 1790 to Charleston, South Carolina, in the United States by the French botanist André Michaux. In the wild, the species is most often found as a multistemmed large shrub, but 200 years of cultivation have resulted in a huge number of cultivars of widely varying characteristics. 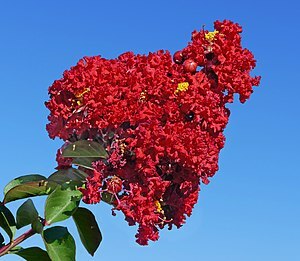 Today, crepe myrtle varieties can fill every landscape need, from tidy street trees to dense barrier hedges to fast-growing dwarf types of less than 60 cm (2 ft), which can go from seed to bloom in a season (allowing gardeners in places where the plant is not winter-hardy to still enjoy the intense colors of the frilly flowers). In Europe, crepe myrtle is common in the south of France, the Iberian Peninsula, and most of Italy; in the United States, it is an iconic plant of gardens across the southern United States. Lagerstroemia speciosa, known as queen crepe myrtle, giant crepe myrtle, or banabá, originates in subtropical and tropical India. It can be grown in any similar climate, but in the United States is suitable only for Florida, southernmost Texas, coastal southern California, and Hawaii. It is a large evergreen tree with colorful rosy-mauve flowers and striking white bark, suitable for public parks and avenues; only the seed-grown species is commonly available for sale, unlike L. indica and L. fauriei, which have dozens of cultivars. ^ Blanc L, Maury-Lechon G, Pascal J-P (2000) Structure, floristic composition and natural regeneration in the forests of Cat Tien National Park, Vietnam: an analysis of the successional trends. Journal of Biogeography, 27: 141–157. ^ "Non-wood forest products In 15 countries of Tropical Asia". fao.org. Archived from the original on 18 April 2014. Retrieved 30 January 2012. ^ "Trees: Lagerstroemia fauriei". www.ces.ncsu.edu. Archived from the original on November 23, 2007. Retrieved 2008-01-07. "Lagerstroemia". Australian Plant Name Index (APNI), IBIS database. Centre for Plant Biodiversity Research, Australian Government. Wikimedia Commons has media related to Lagerstroemia. "Lagerstromia" . Collier's New Encyclopedia. 1921.